Combine a land tour of Italy with a Mediterranean cruise in one all-inclusive Italy cruise tour vacation package. These all-inclusive Italy cruise tour trips include land tours of Italy’s great art cities Venice, Florence, and Rome with a Mediterranean cruise from Rome or Venice. The Italy tour includes 4-star accommodations, transportation between Italian cities, guided tours, breakfast daily and most dinners. Choose your stateroom on the Mediterranean cruise: inside, outside, balcony, or suite are all available. When the Italy cruise tour vacation package is booked with airfare from the United States and Canada airport transfers are included. Visit Italy’s sightseeing highlights by land. Embark your Mediterranean cruise from Rome of Venice. Discover the eastern and western Mediterranean cultures by sea. Cruise staterooms are discounted significantly. 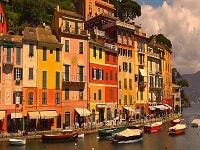 The Italy cruise tour vacation package may be purchased land-only or including airfare to Italy. The price quoted is with airfare from New York City. Italy airfare may be included from airports in the United States and Canada. For more details about these all-encompassing Italy tours with Mediterranean cruise vacation packages click the links below. Combine the 9-Day Venice, Florence, Rome Escorted Italy Tour with a 7-night western Mediterranean cruise from Rome on the Norwegian Cruise Lines Epic. 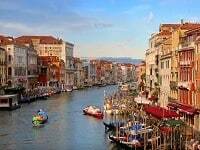 ItalianTourism.us below rate cruise stateroom prices will save you big money on this all-inclusive Italy tour and Mediterranean cruise vacation package. The tour of Italy includes first class 4-star accommodations with 2 nights in Venice, 2 nights in Florence, and 3 nights in Rome. Skip the line tickets and fully escorted tours of Italy’s sightseeing highlights. The vacation includes 31 meals are all included. The vacation package may be purchased land-only or including airfare to Italy. The price quoted with airfare is from NYC. Click here for the best deal on this package. Combine the 9-Day Rome, Florence, Venice escorted Italy tour with an eastern Mediterranean cruise from Venice to the Eastern Mediterranean and Adriatic ports, including the Greek Isles, Split, Dubrovnik, Ravenna, Kotor, Athens, and Trieste. The escorted tour of Italy includes 3 nights in Rome, 2 nights in Florence, and 2 nights in Venice. After your escorted trip through Italy embark on a 7-night Venice cruise to the Greek Isles. Sail on your choice of MSC Sinfonia, MSC Poesia, Costa Luminosa, or Royal Caribbean Rhapsody of the Seas. This all inclusive Italy tour with eastern Mediterranean cruise vacation package includes all transfers, guided tours, and 31 meals: 14 breakfasts, 6 lunches, 11 dinners. 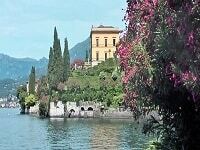 Click here for the best deal on this Italy cruise tour package. Combine the 9-Day Rome, Florence, Venice Escorted Italy Tour with an eastern Mediterranean cruise from Venice to the Greek Isles. The escorted tour of Italy includes 3 nights in Rome, 2 nights in Florence, and 3 nights in Venice. After your escorted Italian trip embark on a 7-night NCL’s Norwegian Star cruise from Venice down the Adriatic to the Greek Isles. Enjoy the beautiful Adriatic port of Dubrovnik and Greece’s bustling city Athens. The relaz in gorgeous Santorini. This all inclusive Italy tour with eastern Mediterranean cruise vacation package includes all transfers, guided tours, and 31 meals: 14 breakfasts, 6 lunches, 11 dinners. Click here for the best deal on this package. Our affordable Italy cruise tour packages offer the opportunity to cruise the Mediterranean and spend extended time in its most beautiful country, Italy, touring its great cities by land. An Italian tour with Med cruise vacation package offers an escorted tour of the world’s most beautiful and culturally rich Italian cities combined with a Mediterranean cruise. ItalianTourism.us Mediterranean cruises combined with the best escorted land journeys through Italy. Enjoy Italy’s breathtaking scenery, its world-famous food and culinary tradition, and its lively passionate culture. Our Mediterranean cruise tour packages provide you enough time on land in Italy’s great cities Rome, Florence, and Venice to visit historic landmarks, do some great sightseeing, eat in authentic trattorie, and shop Italian style. All this while Italian Tourism takes care of all the details of your Italy cruise tour including the hotel accommodations in Rome, Florence, Tuscany and Venice, sightseeing and escorted tours hosted by a tour guide, and airport and cruise port transfers. Italy tours combined with an Italy cruise package are available from ItalianTourism.us at the lowest price, GUARANTEED. For more information click here to send Italian Tourism an inquiry or call 800-227-1577 to speak with an Italy cruise tour expert. 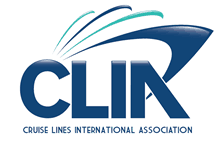 If you already have a cruise from Italy and are looking for a customized Italy pre-cruise package or Italy post-cruise package that includes port transfers, Italy pre-cruise hotel or Italy post cruise hotel, and Italy land tours call 800-227-1577 or click Rome pre-cruise package or Venice pre-cruise package for a custom Italy cruise tour vacation package. If you prefer more time independently traveling in Italy before or after your Italy cruise then Italian Tourism “Italy vacation packages” would be the right pre-cruise or post-cruise Italy vacation for you. Each Italy travel package includes hotel accommodations before or after your Italy cruise and breakfast daily. You are free to purchase optional Italy tours, or explore Rome, Florence and Venice on your own with any of Italian Tourism Italy cruise tours. 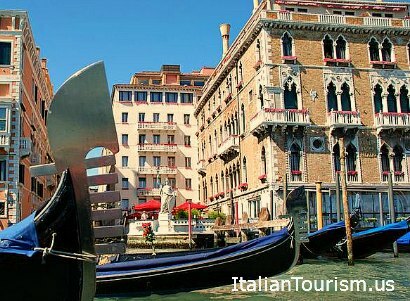 ItalianTourism.us Italy cruise tours is famous for its unbelievable Mediterranean cruise combined with Italy tour packages. Call us today 800.227.1577 to speak with an Italy Tour and Mediterranean cruise vacation specialist.